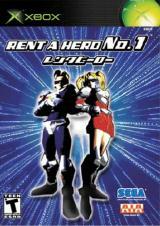 The unreleased English translation of Sega’s Rent-A-Hero No. 1 for the Xbox, the first such entry in the series ever planned for release outside of Japan, has appeared on torrent sites in an apparently complete state. Developed by Hitmaker (formerly — and currently — Sega-AM3) and planned to be published in the USA by the apparently short-lived AIA USA, Ltd., Rent-A-Hero No. 1 is a strange game that combines traditional RPG exploration mechanics with Final Fight-like battles. The series started life on the Mega Drive in 1991, with an expanded 3D remake released for the Dreamcast in 2001 - neither of which were released or, as far as I’m aware, planned to be released outside of Japan. The Xbox version of Rent-A-Hero No. 1 is a slightly modified version of the Dreamcast release, with new online capabilities (and, of course, a brand new English translation). This translation was very close to release and, in fact, was even reviewed by GamePro in February of 2003. I haven’t had a chance to check the game out, but early impressions from elsewhere on the internet tell of an apparently complete game, with only minor text errors present.